A badass person is defined as someone who is tough, intimidating and uncompromising. These are also qualities that most macho men would love to possess. 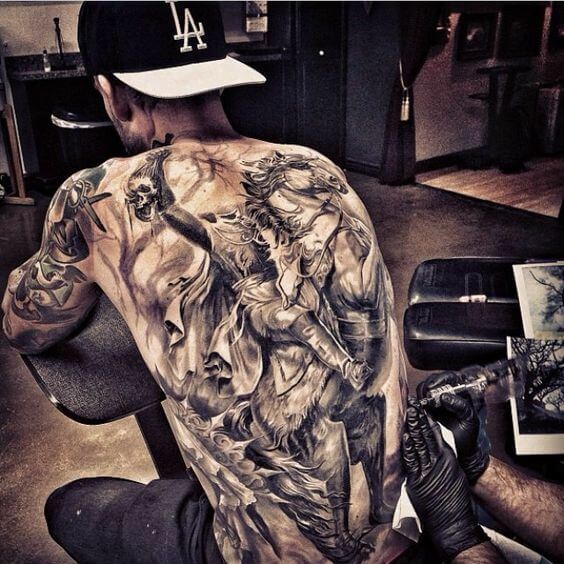 As such badass tattoos for men are one of the most often requested tattoos by men. Today we will explore what these tattoos are and the reasons behind their immense popularity. This is more of a subjective question as badassery is not something that can be measured and as such what might be a badass tattoo for one person might not be the same for someone else. We will, however, try our best to give as clear a picture as possible of badass tattoos for men. Generally speaking, any tattoo can be a badass one if it somehow manages to exhibit the toughness and uncompromising nature usually associated with a badass person. This can be in the form of slogans and symbols associated with this trait or a scene inspired by some popular movie or TV show such as ‘Breaking Bad’. Sometimes it can be a lot more subtle like an abstract image that is open to interpretations. Other times it can be very straightforward like the imagery of wild animals or men or women in aggressive poses. This is a very wide and open genre of tattoos and encompasses tattoos of different styles, sizes, and complexity but the one thing that they all have in common is that most people who will see them for the first time will feel a bit intimidated. A picture can often speak clearer than a thousand words and it is even more profound in the world of tattoos. Most people get tattoos as a way of exhibiting either the character traits they possess or wish to possess. No one likes to be weak. Everyone would love to be seen as strong, especially when considering mental fortitude. 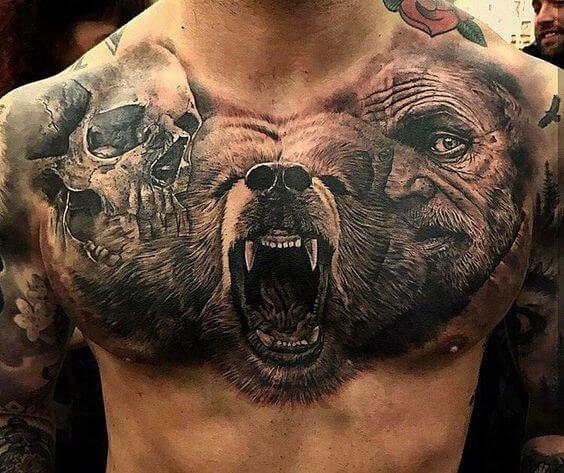 A badass tattoo is the perfect way to create such an impression. 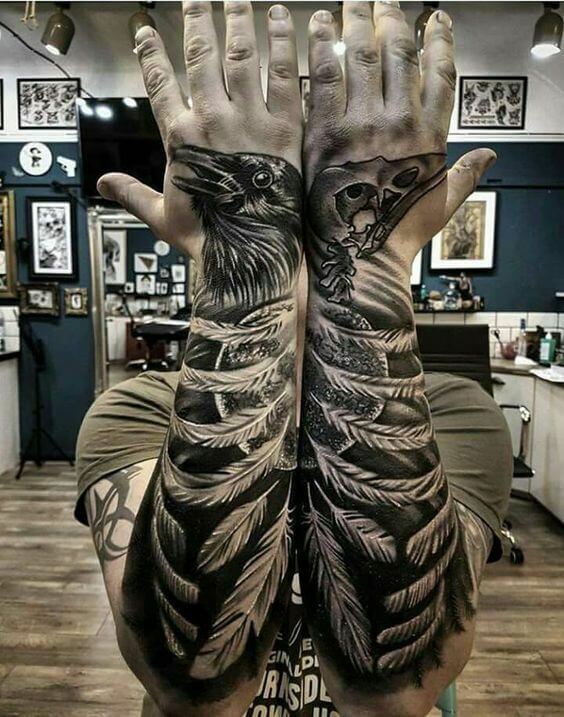 Few things can demand as much respect as a really bold and intimidating tattoo especially when all of this can be achieved without saying or doing anything. There is also the influence of media and pop culture in this. Most movies, TV shows and comic books will portray scenarios where everyone gravitates towards badass men who often come to the rescue of the weak and weary while being as cool as humanly possible. This constant portrayal of the desirable man to be a badass is also reflected in the taste of men when it comes to tattoos. They too want to be seen as highly desirable men who can be cool and tough at the same time. Pretty much every anti-hero, apart from being the silent brooding type, sports a myriad of tattoos that highlights how badass he is. It is an imitation of these idols that has also led to a boom in the popularity of these badass tattoos for men. They are as relevant to modern culture today as was rock music a few decades back. A full tattoo designed for the brave, this tattoo focuses on many unique elements. The design is exquisite and equipped with details that are intensely precise that certainly adds to the realness of the look. 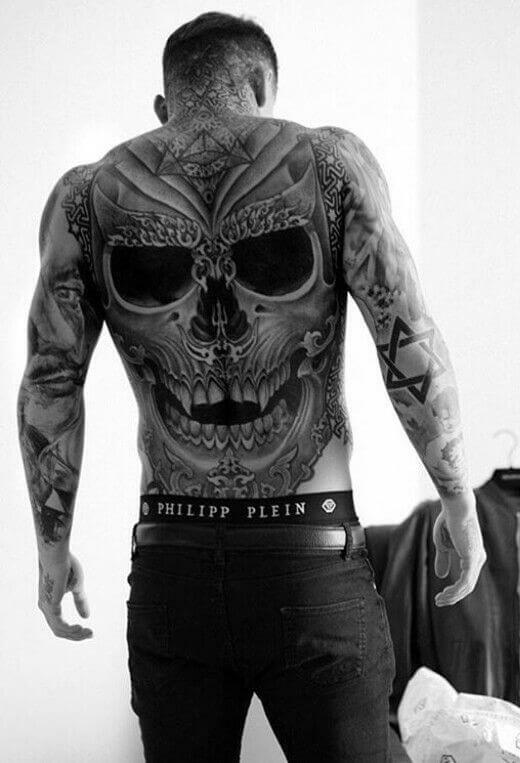 The very definition of a badass tattoo, this design not only covers your back but also extends to the sleeves. Ideally crafted to fit to the forearms, this specific design of badass tattoos can also be done on other body parts. It features the power of these feathered creatures with fine points that are impressive and strong. 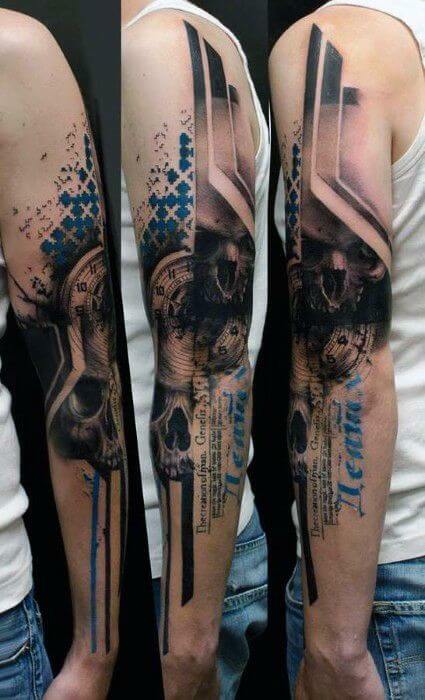 Predominantly dark in color, this badass tattoo is a challenge to create, but the output is certainly outstanding. 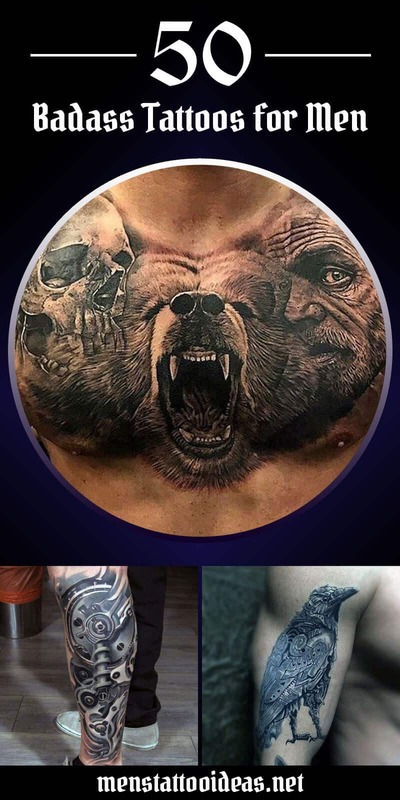 This example of badass tattoo ideas highlights three major elements, and while they may seem individually unrelated, the fusion of the ink brews them in a unique harmony that works. As the central design fades and fuses with the lateral ones, it brings out a powerful message of strength and vigor. If you are looking for a rather non-conventional badass tattoo design, this one is a great choice. 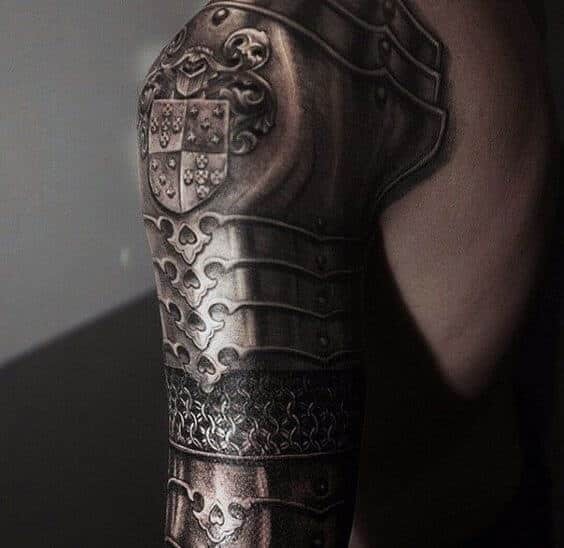 The 3D look of this metal shield inspired design gives it a look perfect for the sleeves and forearm. It looks tough and badass, to say the least. 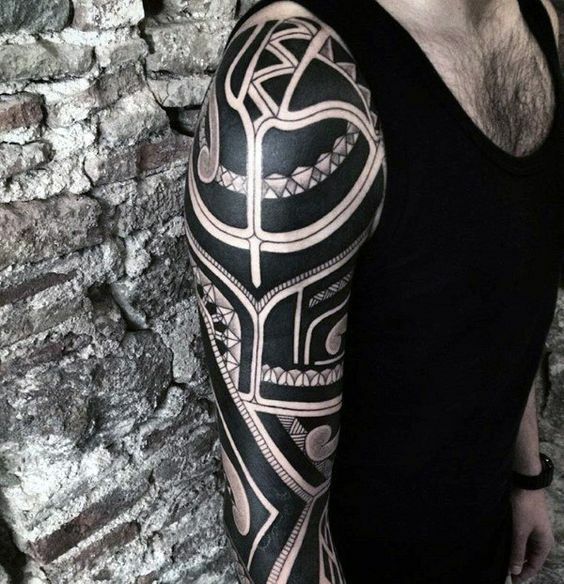 A unique, almost geometric design that is perfect for the sleeves, this badass tattoos idea is a favorite. The blend of straight edges, curved corners, and other asymmetrical details fits well with any gender. Its monochromaticity adds to its appeal. 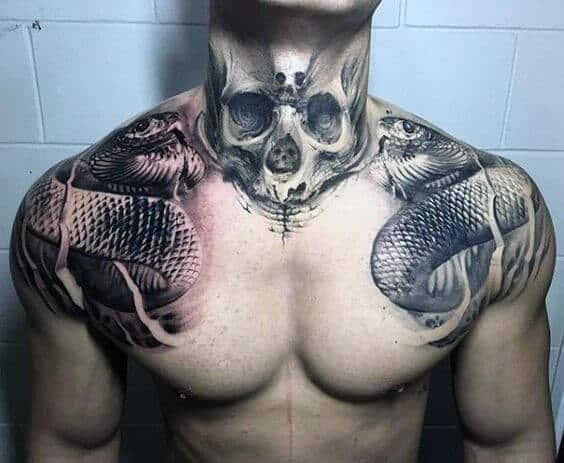 Possibly one of the most unique skull tattoos ideas, this is certainly a design that captures most eyes. The look is one of the realest there is, and the details are carefully crafted to add to the strength of the design. 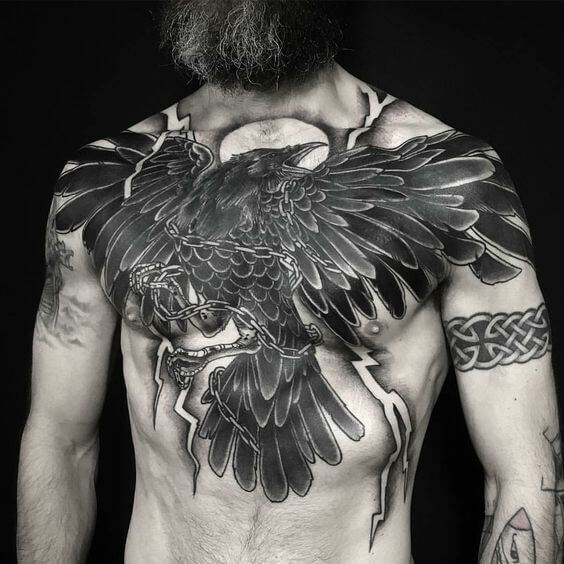 Badass tattoos for guys featuring the strength of the feathered fowl always appeal to most who intend for a design either on the chest or on the back. This particular one is so unique that it showcases the animal in action of conquering the night with its power. This design is perfect for those who are constantly fascinated by the illuminati and illuminati-like symbols. The highlight is not that though, as the symbol fuses effectively with other elements that give it a totally badass look. Creatively and uniquely crafted, this design features a tri-headed monster that is not only appealing as a chest or back ink. The details of the fangs, body hair, and eyes all scream badass. What sells this design is the incredible mix of colors, making it artistically badass in every detail. The power of the screaming monster and the addition of rather unique background details certainly makes it appealing to eyes and powerful to the mind. This totally badass design is perfect for those who want a cohesive tattoo that features unique details and elements within it. 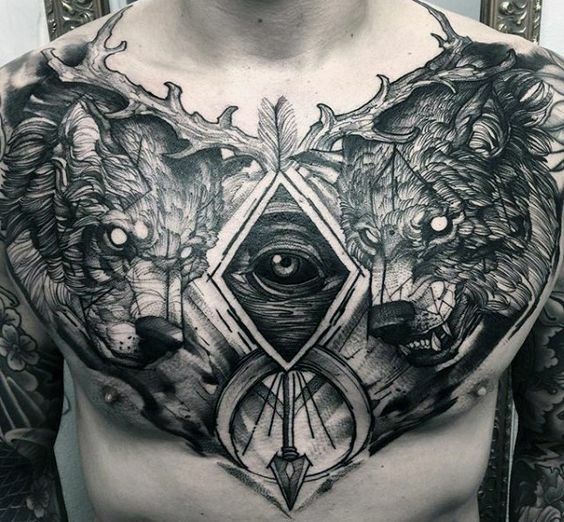 This design practically has everything you need in one major ink that covers the whole of your torso creatively. An ingenious example of badass tattoos for men that will surely have people take a second look, this one is another favorite especially for those who are adventurous enough to shave their heads and have it inked. It is definitely a creative way to showcase a 3D design. The design is not as loud as the others, but is certainly as unique. It displays different elements that are distinctly one-of-a-kind and showcases certain individuality to it. The design completely captivates a persona of strength and power. If you’re thinking of badass, this design can be your top choice. It blends the power of the shark with the flowing curves of the waters creatively. The predominant dark color gives the design a very strong imagery. Apart from the design of a tattoo, its placement also makes a huge impact. While most tattoo ideas for men can be placed practically anywhere around the body, this particular design works incredible when done on the neck and shoulders. The transition of colors and the blend of details look amazingly creative and badass. Rack up the badass points with this tattoo, which covers almost your entire back, half your skull and your arms. This design might be extra daunting for you and intimidating for those who will see, but it will give you an air of invincibility like no other. A wolf tattoo always evokes power, and this design, with its contrasting colors and splash of red, makes you look extra powerful. The placement of this tattoo is also perfect, as it is prominent without you having to make an effort to show it off. 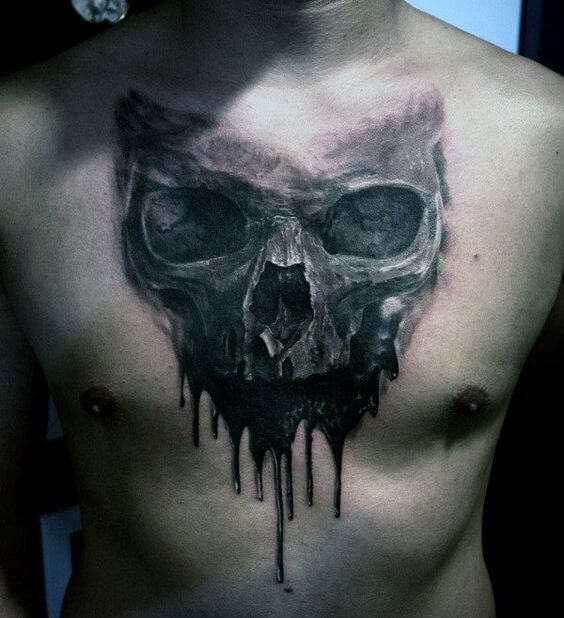 A skull tattoo always looks menacing, and having one on your chest is like a badge of honor. This design features a skull with the top shaved off and a paint-like drip detail on the jaw for a unique touch. The variations on the pattern of this sleeve tattoo, featuring heavily shaded geometric shades, which entirely covers both your arms, are guaranteed to draw attention wherever you go. The design extends to your chest, so it looks good whether you keep your shirt on or not. 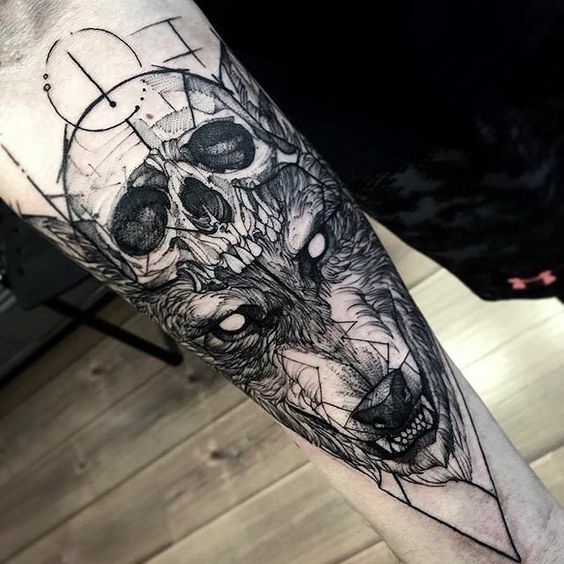 The design of this tattoo, which juxtaposes a skull against a wolf and a sharp fang that looks like a diamond tip, is beautiful in an ominous way. Wear it proudly on your forearm, the best place to showcase it. 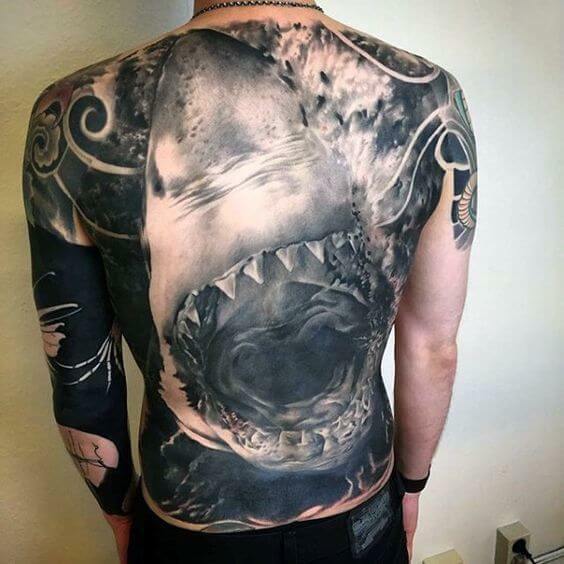 This tattoo design is definitely not for the faint of heart, as it covers your entire back. If also features shading and highlighting for an almost 3D effect. A work of art, this design lets you channel your inner Cyborg. Ever wondered how it feels like to be Iron Man? This tattoo design, which covers your entire arm, features a mechanical, robot-like pattern against muscle tissue. It’s just what you need to look extra cool – and intimidating in a very good way. 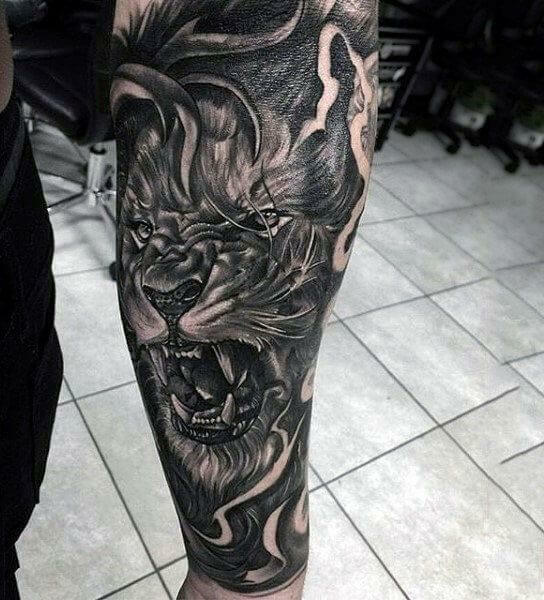 This ferocious lion tattoo design symbolizes courage, strength, pride, and royalty. The exposed fangs gives this design an instant dose of wicked, and its monochromatic color scheme makes it an instant classic – not to mention a very low maintenance one. At first it may seem like there are too many details going on in this intricately designed tattoo, but that’s what makes it unique. The pattern features a skull and triangles arranged to form diamond shapes. The shading gives it an artful 3D effect. 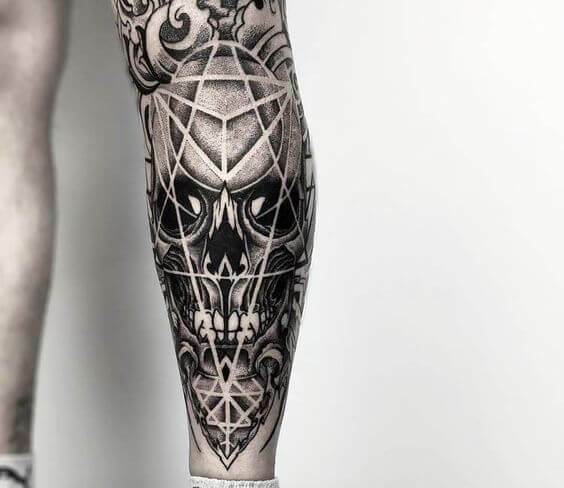 This tattoo design evokes contrast, as it features a badass skull and an elaborately designed cross that melds into one shape. The heavy shading of this monochromatic design makes for an ashy, lifelike effect. Wear it loud and proud on your forearm. 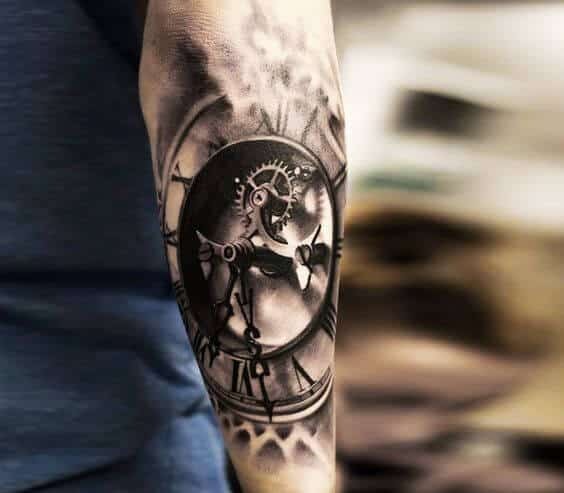 Featuring a black and white design depicting the mechanics of a watch, complete with watch gears and all, this is a badass tattoo for guys that reflect the raw mechanics of time itself. Located on the rear of the forearm, this is a small to medium sized design for men. 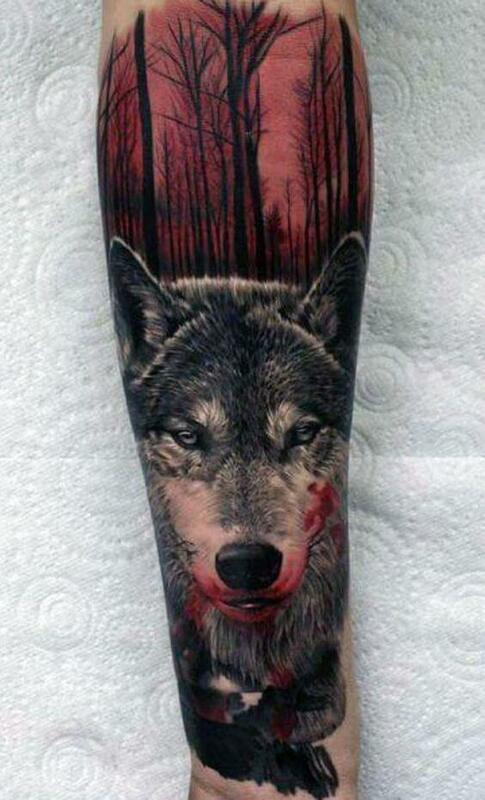 Few badass tattoos look as good as this one does, featuring prominent black and red color schema. 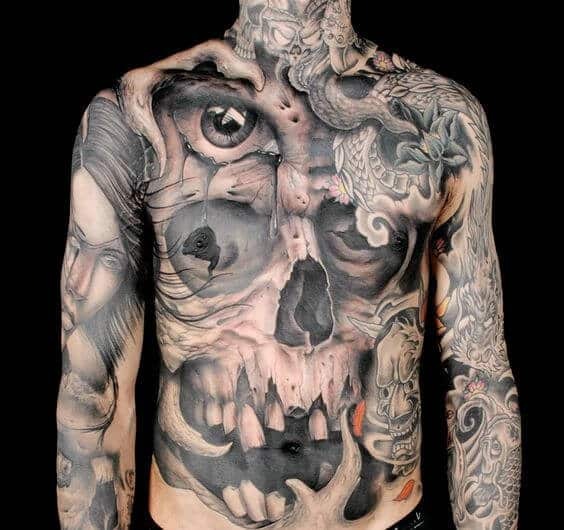 This tattoo spans the arms, shoulders, and outside of the torso, leaving the middle-chest area as bare skin. Featuring eyes on the upper chest, and scales in other areas, this tattoo is reminiscent of a dragon or cool monster. For one of the more skull-oriented badass tattoo ideas, check out this one that spans the entire arms and frontal torso area. It uses an awesome skull and abstract patterning concept that is simply eye-popping. This one is definitely not for the faint of heart, but for guys who can pull it off it is pretty amazing. This is mostly black and white ink and not a colorful design. 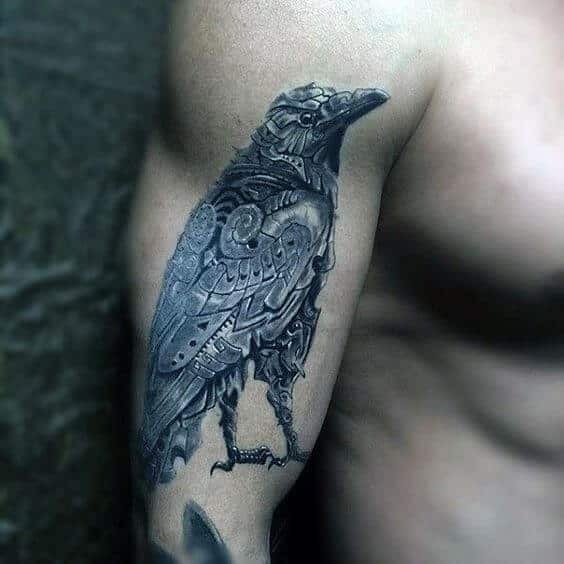 This badass tattoos idea is an incredibly intricate raven design, with the black and white raven being tattooed on the outer bicep area of the man’s arm. The raven is designed with lots of cool fine lines on the inside of the outline, giving it an abstract yet realistic appearance. 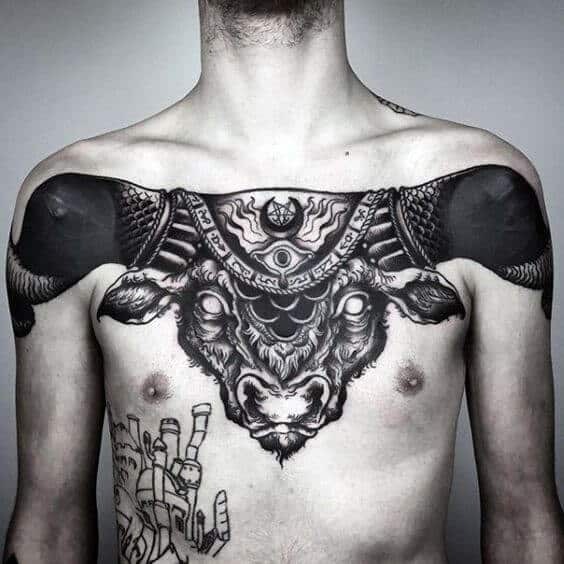 This badass tattoo design features a black and white bull design that spans from shoulder to shoulder, across the upper chest area. The bull’s eyes are white, with the horns being all black, with lots of complex patterning in-between. The bull is adorned with beautiful ornamentation, making this a tasteful yet badass tattoo design for guys. 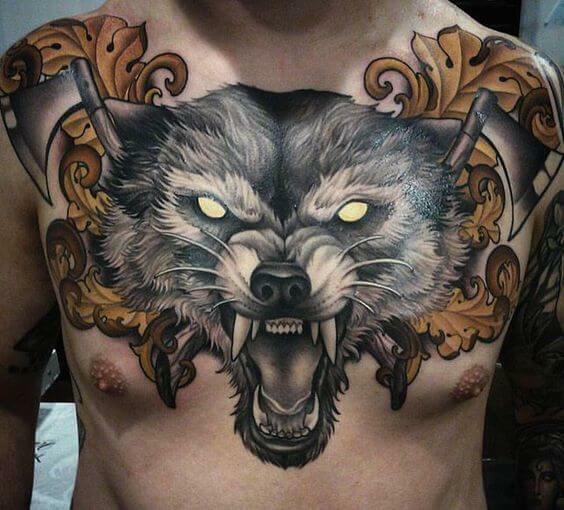 For those lone wolf guys out there, you have got to check out this powerful example of badass tattoos for guys! 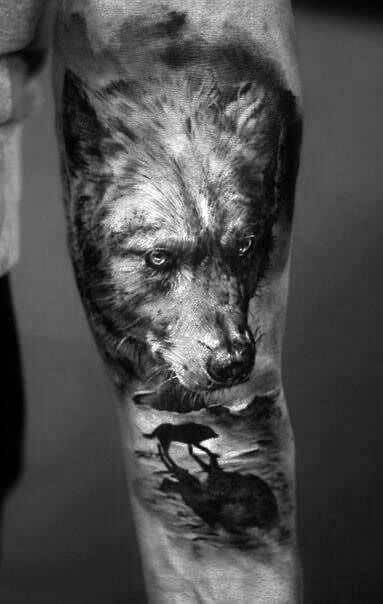 This tattoo features a large black and white detailed wolf head design, which serves as a background for a smaller silhouette design of a wolf in the wild. The tattoo spans across the upper arm area, and will look amazing on any guy but especially guys with a more muscular build. 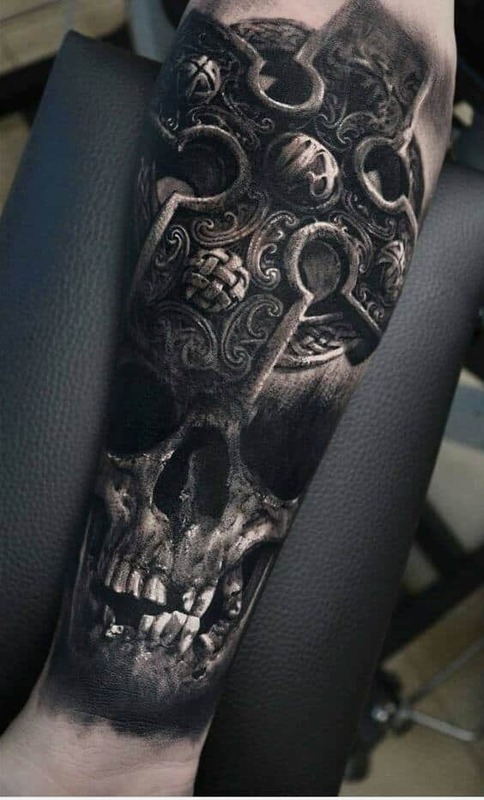 Skull designs are always awesome when it comes to any badass tattoos for men, and this concept makes excellent use of the skull theme. It also does well to integrate some color into the design, with some navy blue writing and cross-type patterning near the top of the design. The skull is sort of designed into the background of the design, and the tattoo spans the better part of the arm. When trying to consider some tattoo ideas for men, this one is among the most challenging and complex of them all. 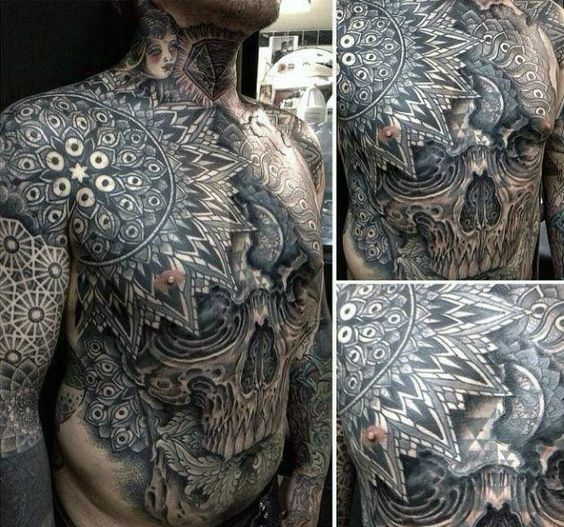 Featuring a black and white ink design, with some abstract kaleidoscope-type texturing on the shoulder and upper chest, this concept also features a large skull that is front and center in the tattoo. Definitely a larger creation, and not for someone who wants a small tattoo. Tattoos ideas are sometimes tough to come up with, so using examples from other sources can be a great idea. 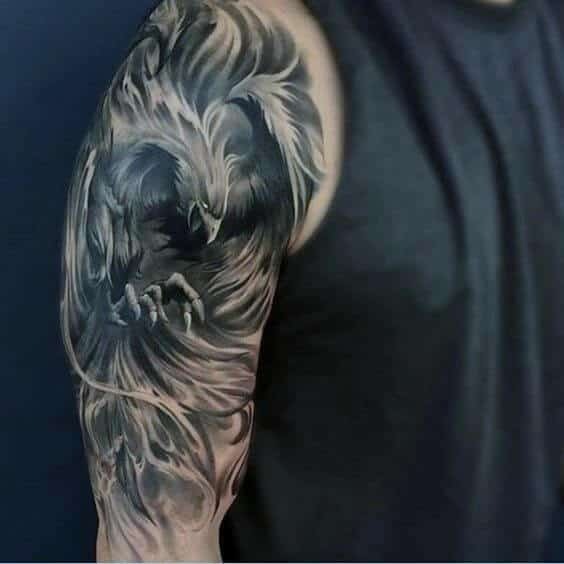 This particular badass tattoo creation is a black and white flowing depiction of a large bird of prey, with talons out ready for action and the beak open for an attack or kill. This is truly a badass concept, that is also graceful and flowing too. This one can be tough to beat for guys who want a bird of prey tattoo theme. It spans the upper arm and shoulder, and is a medium sized creation. 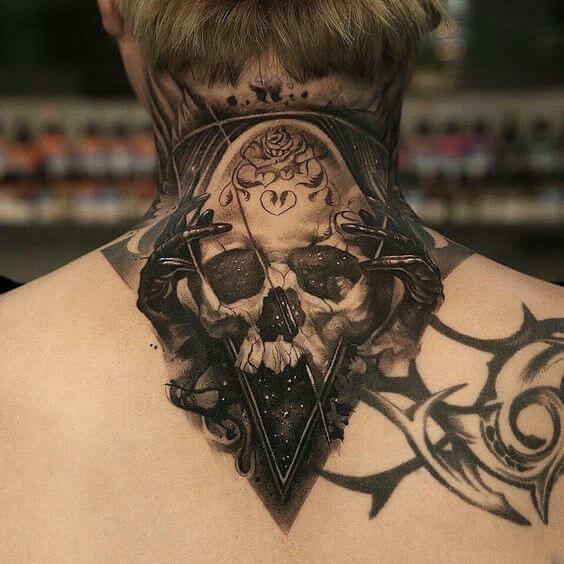 Guys who love a skull theme in terms of badass tattoo ideas are going to love this rendering, which features a prominent skull design set on the back of the neck and upper back region of the body. An incomplete pentagram is serving as a backdrop and outline feature on this tattoo, with some other black-ink designing in the periphery of the tattoo concept. 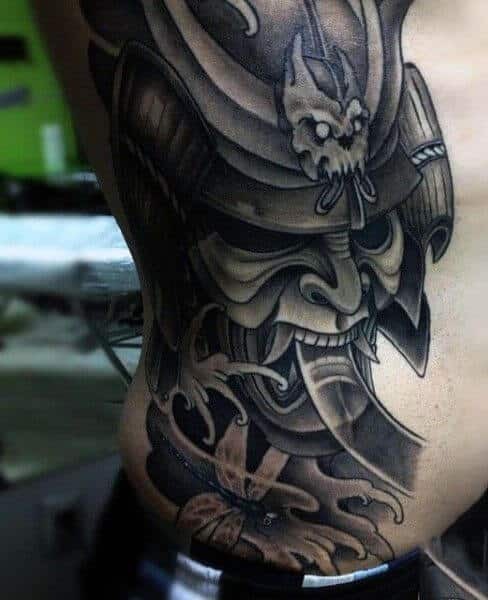 This is definitely one of the more badass tattoos out there these days, and it combines a wild skull theme with a samurai mask as well. 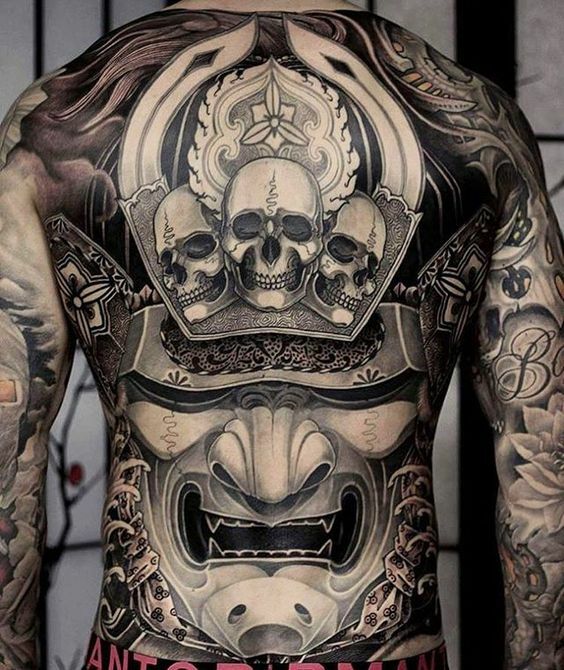 Combining two of the coolest tattoo themes, skulls and warrior themes, this tattoo is extremely large and it spans the entire upper and lower back, shoulders, and arms. Using black ink and no color, this tattoo has three skulls in a row, sitting on top of the warrior’s face armor. 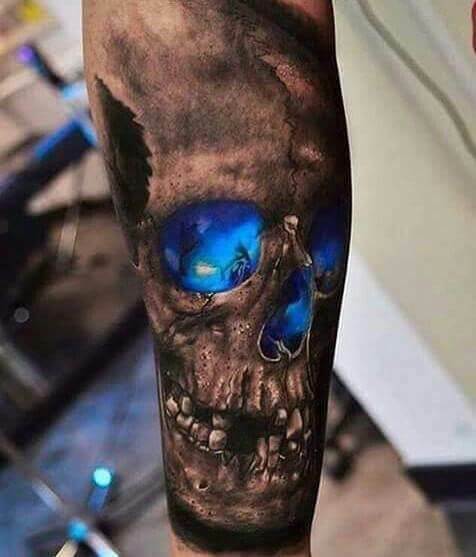 For guys who really want a badass skull tattoo, this concept is incredible in terms of providing a realistic piece that also incorporates some stunning neon-blue color inside the eye holes of the skull. It is all black ink except for the bright blue coloration, which creates some nice depth and variation in the tattoo. Some of the teeth are busted out of the skull for added realism. Some guys want a badass tattoo that is truly massive, spanning most of their upper body. 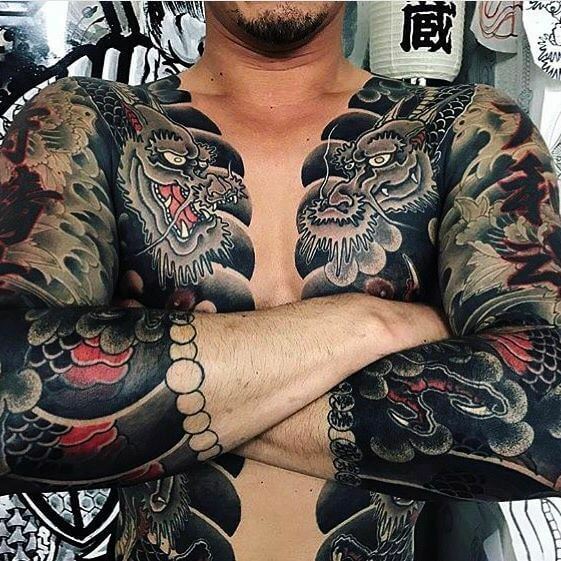 Men like this are going to love this particular tattoo design, since it covers the entire upper and lower back area, along with the shoulders and arms too. It is basically a large black-ink skull concept, which is made more complex and beautiful by including intricate lines inside of the skull to make the patterning and texture much more eye-catching. 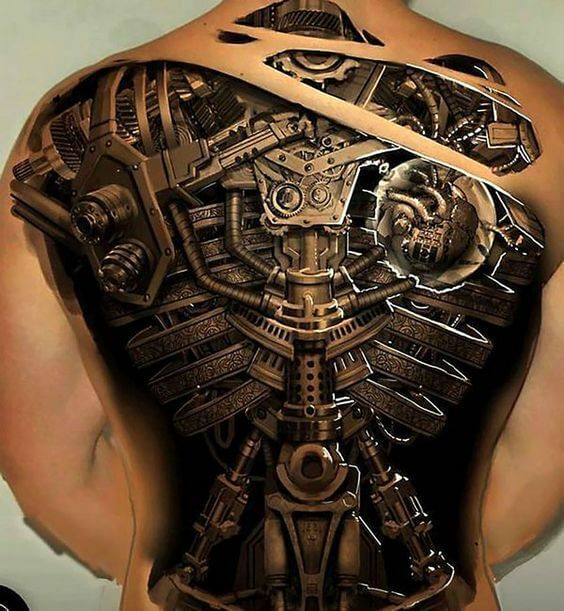 If you are a guy who loves mechanical stuff, and you also happen to be looking for a badass tattoo concept, you are going to love this one. It spans the lower leg and calf, and features black and silver coloration to make a brilliant mechanical design that gives the appearance of machinery inside the body. 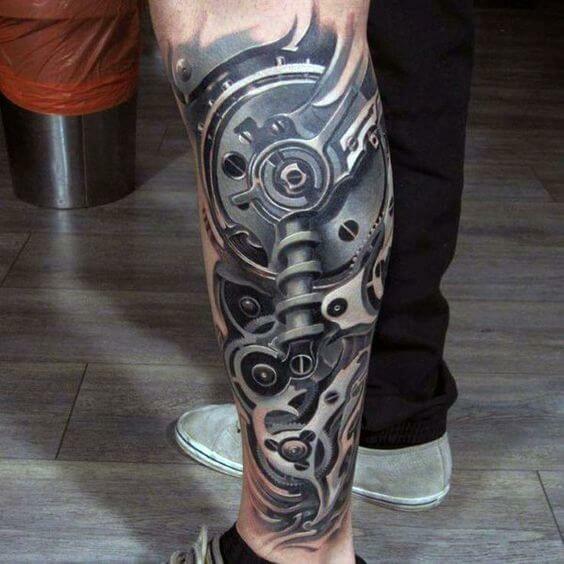 Gears and springs all come together to make for a bionic-man type of badass tattoo! 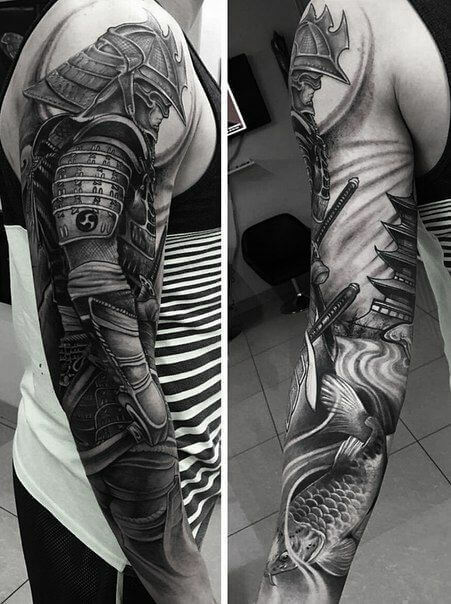 For a more Asian-themed badass tattoo concept, this one features a Samurai design that depicts the side view of a completely geared-up and armored Samurai warrior. This Samurai is done in black ink and it spans the entire length of one’s arm from shoulder to wrist. On the other side of the arm, there is a Japanese pagoda featured in the concept, which helps to bring the whole tattoo together. 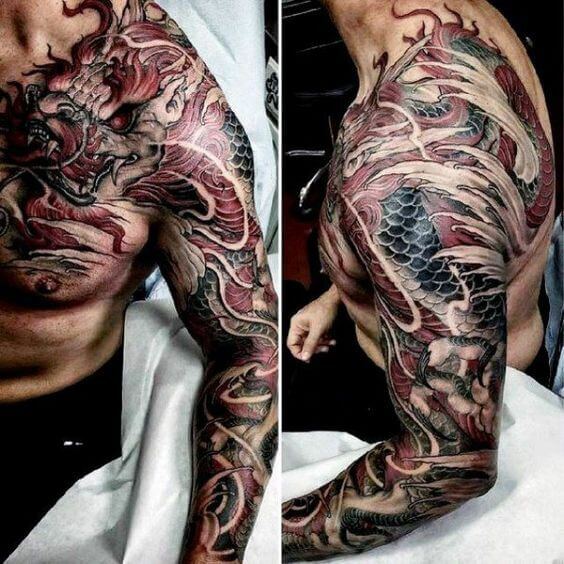 Men who want a large badass tattoo design will love this red and black ink dragon concept. It is large, very complex, and ornate, with incredible detail on all the scales, contours, and facial depiction of the dragon. This one will be perfect for guys who want a badass tattoo that uses color in the imagery. 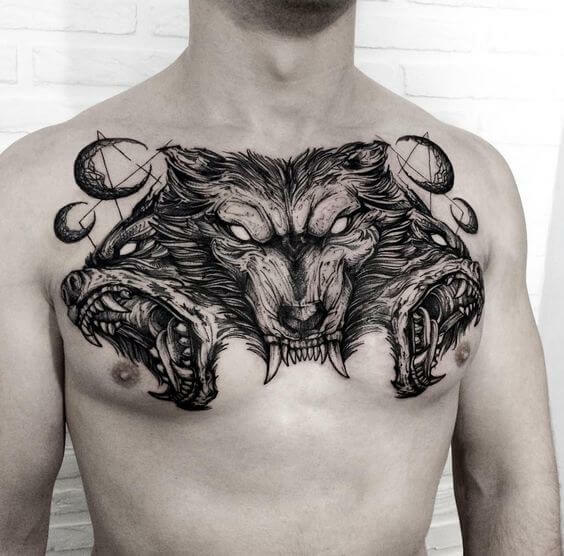 Spanning from the upper chest into the shoulder and entire arm, this is a great one for men who want a very large tattoo concept. 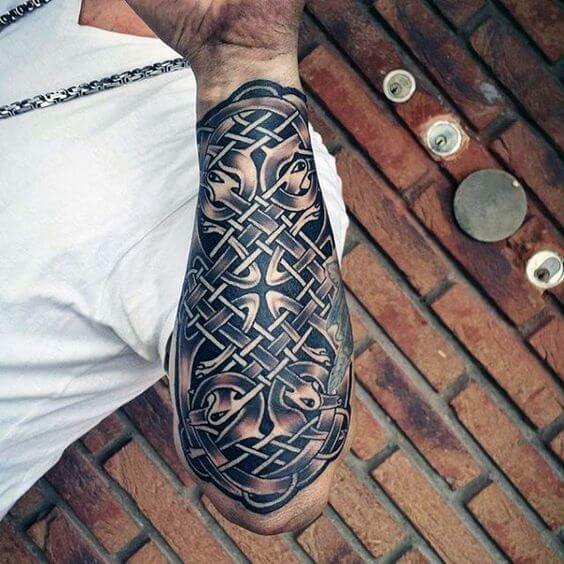 Offering amazing visual texture and patterning, this badass tattoo for guys uses interwoven lines and black ink to create a forearm located tattoo that almost has a kind of Gaelic visual patterning. Perfect for guys who want a badass tattoo that isn’t too colorful, this one is a small to medium sized concept that many men will enjoy. 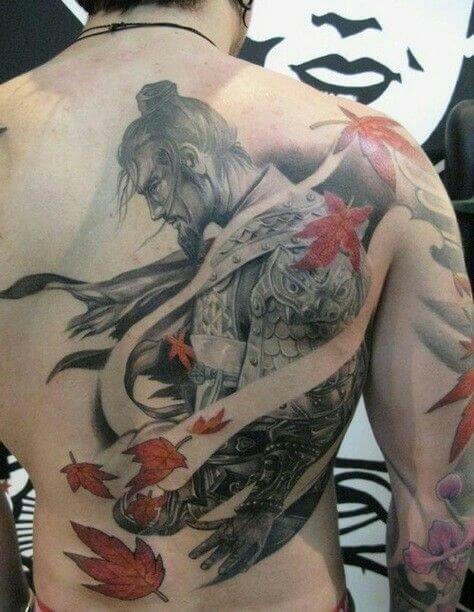 Following a kind of Japanese/Samurai theme, this badass tattoo creation is exceptional in terms of the artistry and masculine features. 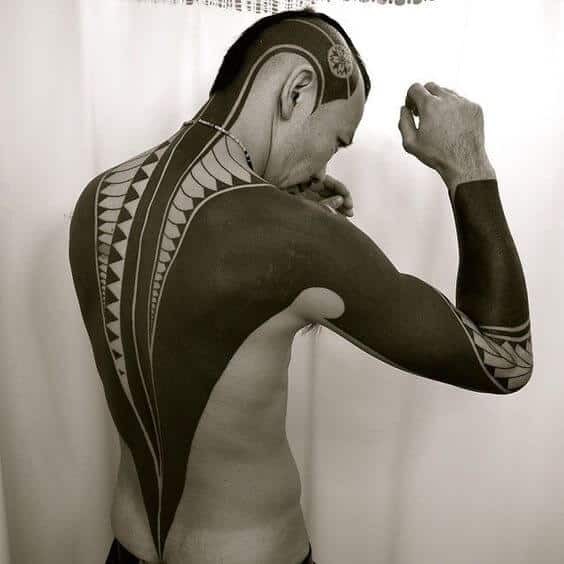 Spanning the lower to upper back, and into one shoulder and arm area, this tattoo is a black and white masterpiece. Some wonderful red color is added to the concept in the form of bright red Japanese maple leaves that are swirling around the stoic warrior. 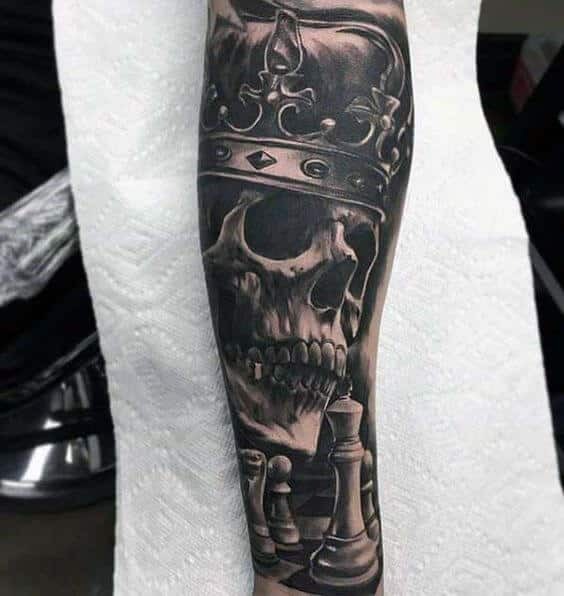 Featuring a kind of Regal/Royalty theme mixed with a skull design, this badass tattoo concept for guys utilizes a chess theme as well. 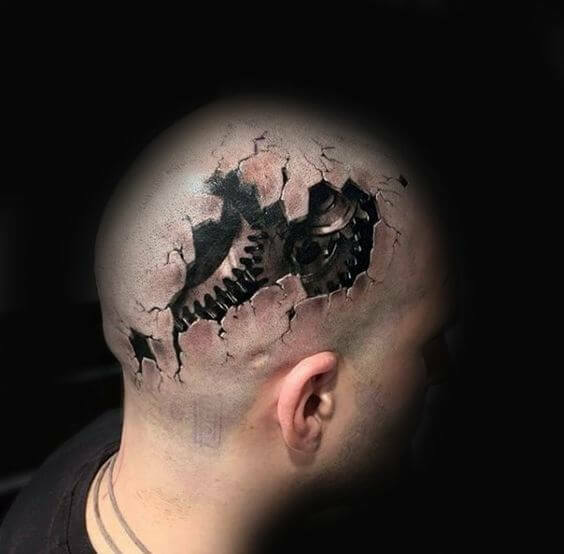 Using black ink and no real color to be found, this tattoo is an awesome spin on the conventional skull tattoo theme. In the foreground is a chessboard with some chess pieces, combined with a skull wearing a king’s crown on its head. A medium sized tattoo, this concept spans from the upper to lower arm area. 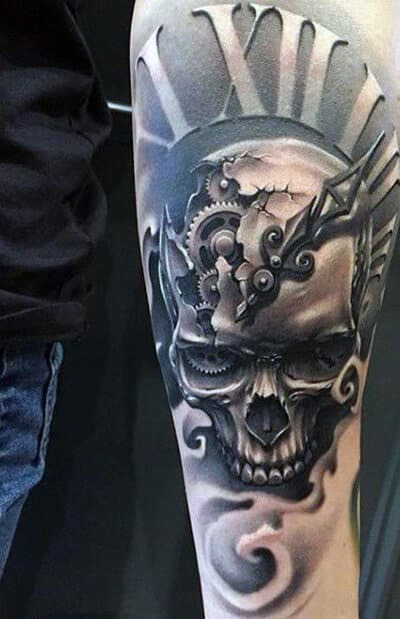 Combining a skull theme with a mechanized, gear oriented concept, this men’s badass tattoo is extremely unique! It uses exclusively black ink and spans the mid-section of one’s arm, with a typical skull design with clean, smooth lines. The part of the design that is unique involves the top left area of the skull, where there is an opening in the cranium that is full of gears and mechanical depiction. 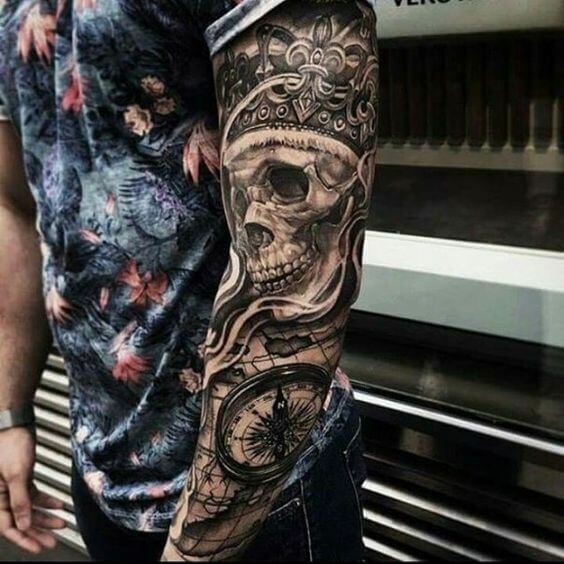 For a badass arm sleeve tattoo concept that guys will love, this option is one that uses a skull theme which is integrated into complex visual texturing and a clock/compass dial lower in the design. This tattoo incorporates black ink without coloration, and spans the upper to lower arm. The skull itself is integrated into the upper arm area, with a clock/compass designed into the lower forearm region. Designed for guys who want a badass tattoo conceptualization, this one is perfect for an arm-sleeve concept that spans the lower forearm to upper arm. 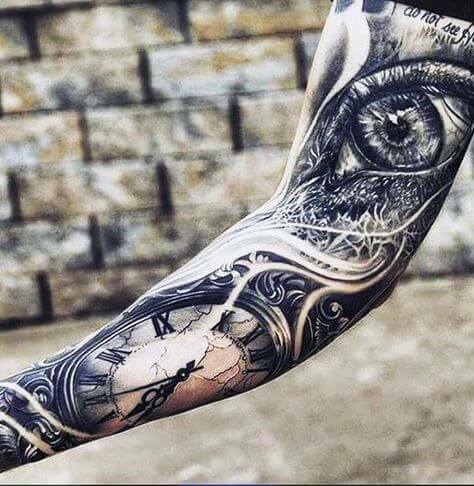 This tattoo uses black ink and no coloration, with an antique looking clock face on the lower forearm, and a detailed eyeball design on the upper arm and bicep area. In the middle of the eye and clock is detailed and flowing lines that provide texture and depth to the concept. 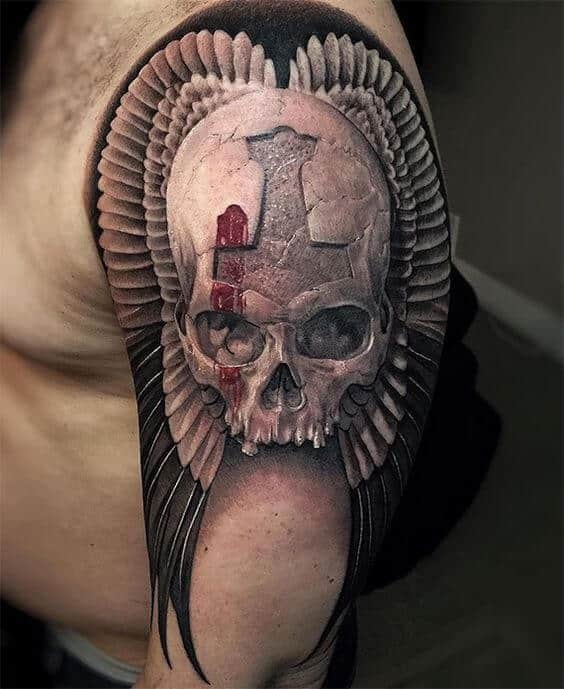 Mixing a cross design with a badass skull depiction, this men’s tattoo is especially impressive and unique for how it combines multiple themes. 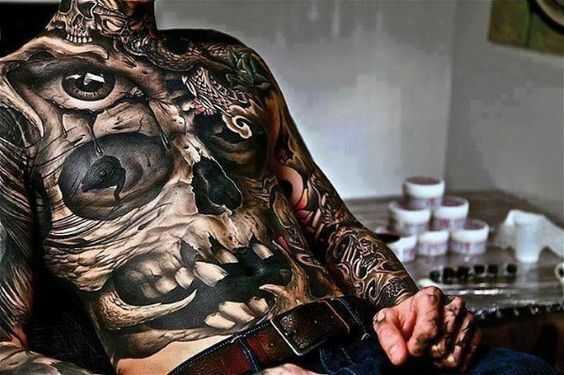 A formidable skull tattoo is something that many men will enjoy, but it is a relatively common theme. 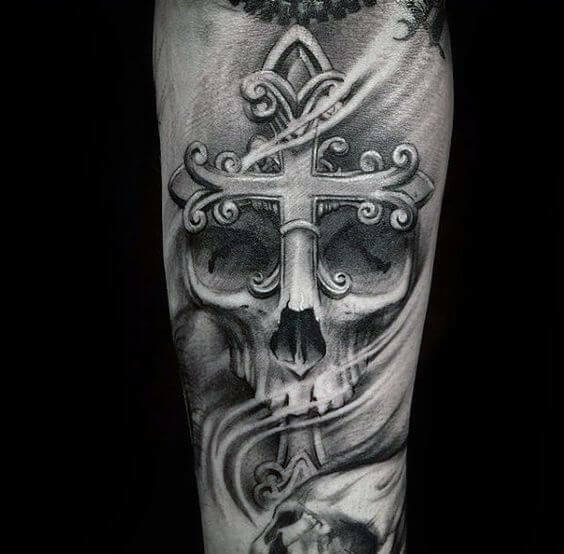 This tattoo puts a unique spin on the classic skull design by integrating an ornate cross design into the skull. Using all black ink and spanning the forearm area, this tattoo is large and complex without being too big. 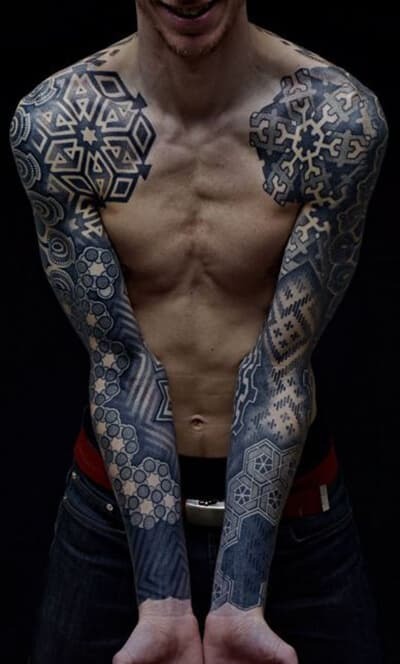 One of the most badass tattoos out there today, this design concept for men is an arm sleeve tattoo that spans from the wrist all the way up the arm into the shoulder area. This concept seeks to create a muscle tissue texturing, almost as though you can see into the arm and look at the muscle fibers inside. 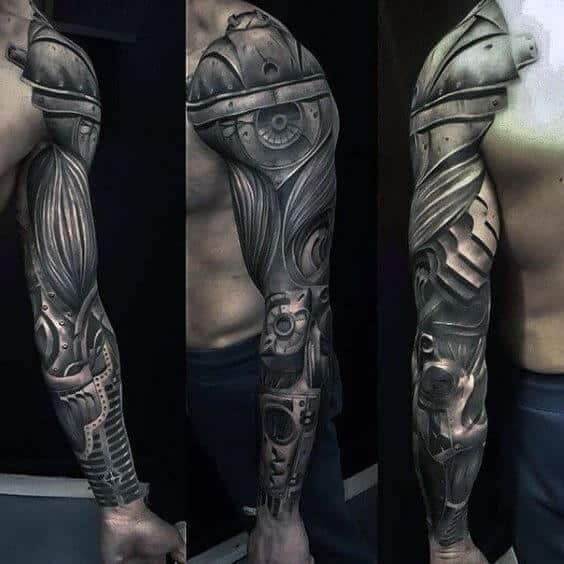 It is a completely badass concept for guys, and it also includes some mechanical looking components by the forearm area, creating a wild bionic theme using all black ink. 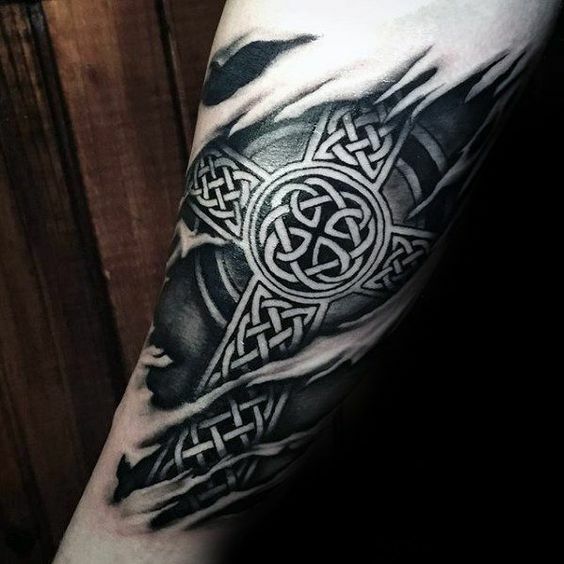 Men looking for a badass tattoo concept who also enjoy Gaelic cross designs will absolutely love this design. It uses all black ink without any noticeable coloration, with tearing/shredded texture surrounding the Gaelic cross that is featured prominently in the foreground. A small to medium sized forearm tattoo concept, this one will be a sure win for men who enjoy the Gaelic cross theme.